(CBS News) Kate went shopping in her closet once again before stepping out with Queen Elizabeth II and Prince William for a visit to Nottingham, England. The Duchess of Cambridge donned the same blue Missoni coat she wore for her first outing with the queen in March, when they visited the Fortnum & Mason department store in London with Camilla, Duchess of Cornwall. 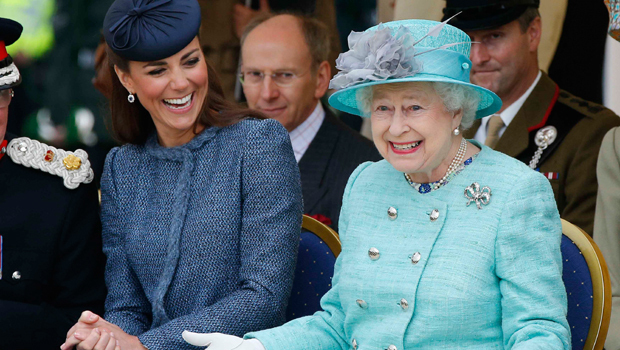 The trip to Nottingham is part of the monarch's Diamond Jubilee tour of the U.K. According to Britain's The Sun, William and Kate arrived by car, while the monarch arrived on the royal train. "Are you waiting for the same train we are?" William reportedly joked to passengers gathered on the opposite side of the tracks at the train station, waving flags. The queen wore a turquoise silk tweed double-breasted coat by Stuart Parvin, the Daily Mail reports. Her hat, like Kate's, was by Rachel Trevor-Morgan. Prince Philip, Duke of Edinburgh, was scheduled to accompany the royal party on the trip but had to cancel as he continues to recover from a bladder infection. In Nottingham, the trio greeted crowds in the city center before heading to the Council House, where they made an appearance on the balcony as thousands gathered below sang a rendition of "God Save the Queen," according to the Daily Mail. After meeting dignitaries at the Council House and attending a ballroom reception, the royals moved on to Vernon Park in Basford. There, the queen unveiled a plaque and William gave a speech praising his grandmother for her role as patron of Fields in Trust, an initiative that preserves outdoor spaces. "How grateful we all are to you for the extraordinary devotion and love you have shown to the people of this country and the Commonwealth," he said. William and Kate took part in a children's sports day in the park while the queen traveled to Burghley House in Stamford, Lincolnshire, for a Diamond Jubilee picnic, the Guardian notes. The monarch was also scheduled to visit the Olympic swimming pool in Corby, Northamptonshire, where she was to watch a high-diving display.